When it comes to eating and drinking, Vietnam has never been an easier place. In tourist areas especially popular places like Hanoi, Saigon, Hoian or Nhatrang… you can find a wide range of food that is acceptable to the international palate. Restaurants are usually clean and menus often have English translations. Apart from most common food – Vietnamese – you can have also French, Italian, Japanese, Thai, Indian… upon your choice. There are quite lots of restaurants around and the price is also varied depending on quality or style. Average standard meal is around USD5 to USD7 including dink while up market restaurant could be up to USD15 or more. In some other areas, the variety might be less but it is not really difficult to find. Most of hotel from 3 star have dining facility but dining out is something more interesting. There are also lots of street foods. This type of food severed very conveniently on side walk but they are sometime far away from international standard of hygiene. Exotic foods are just available in some specific type of restaurant with clear sign and normally for locals so, do not worry if you are not sure what they will serve you during the meal. But, if you want to try something like that, why not? 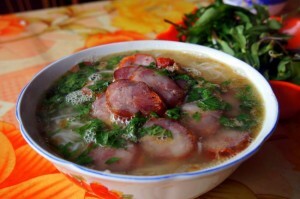 In general, Vietnamese food is tasty but fresh and healthy and easy for people with different palate. During your trip, apart from included meals in the itinerary, we have optional meal when you can hover around for your own choice. Our group leader or tour guide is willing to help you to book for a table, accompany you to or just simply show you where to have good food. We also encourage you to try something local. This is not only to experience local taste but local culture. Local food restaurants we take you to are well selected among the typical ones and good quality. Our gourmet tour programs are designed to provide you a great chance for cuisine experience with different cooking styles and tastes that available in the country. Here in Vietnam, each place has their own local specialties and many of them are famous in the international food slate. Why not? Dig in, learn something, cook it yourself and enjoy it. It would be great to treat your people at home Vietnamese food with the recipes you learn from Vietnam. When traveling in Vietnam, one thing you never have to worry is drinks. There is a huge variety of drinks around ranging from Coke and Pepsi to finest cognac or whiskey. Beer is the most common and quality is good. Beer is served cold in tourist restaurants or bars and locals prefer to drink it with ice. “Bia hoi’ known as “fresh beer’ is rather popular in Hanoi. It is a low alcoholic and cheap beer brewed daily and poured out from big aluminum barrel. A half little glass of this beer costs around 5 to 8 thousand VND can provide you a sit for a hot talk with others on the busy pavement in Hanoi old quarter during a hot and humid afternoon. Except imported luxury stuffs, price for drinks is also very reasonable. You can have a beer around USD1, wine from USD3/glass and drinking water around USD 0.5/bottle. There is also a huge choice for fresh juices. Since Vietnam is a tropical country and fruits available all year around, it is good chance to try the difference. In Vietnam, drinking is something man’s privilege and they prefer to drink rice wine or vodka during their meal. Rice wine is made from rice with a simple method of distill and rather strong, some time up to 50%. Vodka is made from rice also and quality can be compared to some other types of vodka around. Green tea is most common drink for people here. Hot or with ice is just depending on weather or one’s hobby. People drink tea before and after their meals, during their work and it is just a mean to great anyone who visits their home. Another very popular drink in the country is coffee. Coffee shops or bars that serve coffee can be found at almost every street corners or sidewalk. Vietnamese coffee is rather strong but good. Café sua da – Iced coffee with condensed milk is very popular here. Café den – black coffee served in traditional style with a metal filter put atop a cup and coffee is brewed slowly through. One glass of light tea is normally served along when you order coffee. If you find your coffee is too strong then just ask for a glass of hot water or more ice. Capuchino, Expresso or other Western style coffees can be found in bars or western style restaurants around. But once you are in Vietnam, why not Vietnamese coffee? As rice wine or local foods, they make your tour full of local taste.